Billboard signage creates impact, and Big Ideas are all about big impact and high exposure! Billboard signage lets you showcase your brand and products to a mass audience. Viewed by thousands, 24 hours a day, 7 days a week, billboard signage gets huge exposure. Billboard design needs to be creative and innovative, and your branding needs to be perfectly represented. 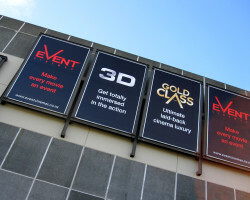 We have years of experience and can advise on billboard materials and production. We will think about how you can use change outs or extra features to make your billboard just a little more striking. Big Ideas have the team that can deliver billboards that meet your specifications. For more info call 09 309 5495 or contact our team now.